Sheffield ‘the city of steel’ has undergone profound change since its iconic steel industry closed down in the 70s and 80s (as well as coal mine closures). The name Sheffield is derived from the River Sheaf, which runs through the city. Historically Sheffield is part of the West Riding of Yorkshire, and is now part of South Yorkshire. The population of the City of Sheffield is 555,500 (2010 est.) and it is one of the eight largest regional English cities. In the Nineteenth Century, Sheffield gained reputation for being premier producer of steel. It made key innovations in the development of stainless steel. This was used in a variety of tools and cutlery and became very popular. This growth of the steel industry made Sheffield a key player in the industrial revolution. 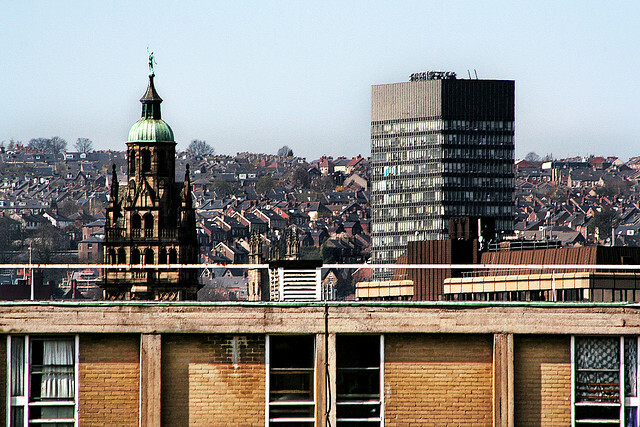 Sheffield has two universities – Sheffield University and Sheffield Hallam University. 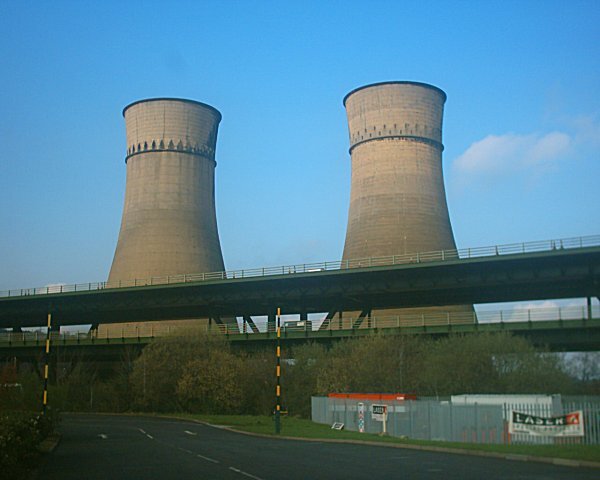 Sheffield Cooling Towers. The two towers were destroyed in a controlled explosion in 2008. (BBC link) There were part of the former Blackburn Meadows power station and they were situation close to the viaduct on the M1. Sheffield has the highest ratio of trees to people of any city in Europe. 2.5 million trees. As early as the fourteenth century, Sheffield was known as a place for the production of knives. It was even mentioned in Chaucer’s Canterbury Tales. In the 1980s, it was often called ‘The Socialist Republic of South Yorkshire’ because of its strong left wing politics. The Sheffield District of Hallam was said to the wealthiest part of the UK, outside London, in a 2004 report by Barclays bank. 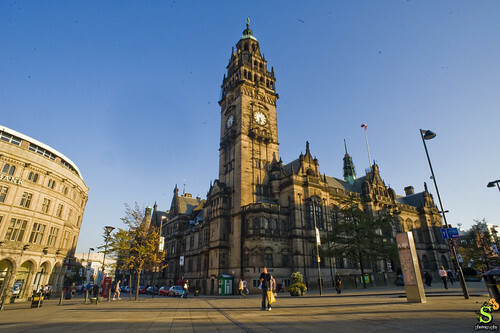 Sheffield is known as a ‘green city’ It provides much energy from incinerating waste. 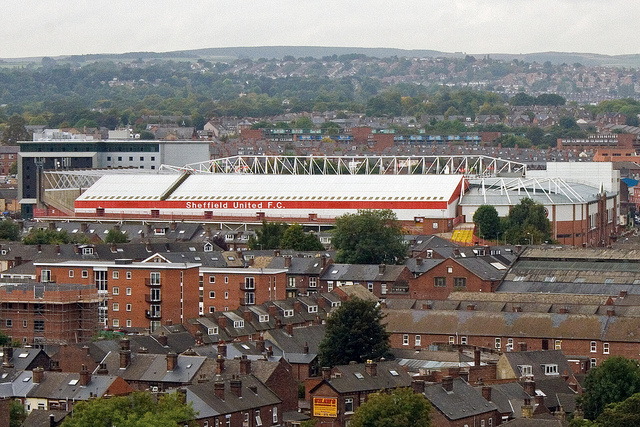 Sheffield boasts the world’s oldest football club – Sheffield F.C. It was formed in 1857, mainly by a group of cricketers. Sheffield F.C. won the F.A. Amateur cup in 1904. Sheffield Wednesday is one of the oldest professional football clubs in the world, and the fourth oldest in the English leagues. Sheffield is sometimes informally known as the largest village in England because of isolated location amongst seven hills, though city status was granted in 1893. Sheffield hosted the world’s first football tournament (played under Sheffield Rules) – the Youdan Cup in Feb-March 1867, featuring 12 teams. The competition was won by local side Hallam at Bramall Lane. It preceded the FA cup by four years. The Sheffield Rules was a code of football used between 1857 and 1877. They had a big influence on Football association rules, which later finally codified the game. Sheffield Rules introduced the concept of corners, free kicks, heading the ball, and goal keepers. Photo Marc – photo of amateur cyclist racing up Cote de Jenkin in hill climb. 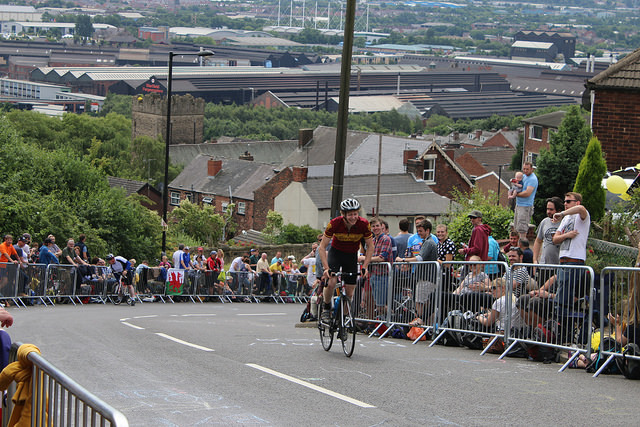 Jenkin Road featured in a the 2014 Tour de France, stage 2. It was the last climb of the long and tough stage, which started in York and finished in Sheffield. The stage was won by Vicenzo Nibali, who went on to win the Tour that year. Bramall Lane was opened in 1855, originally as a cricket ground. Professor Barry Hancock OBE – world renown cancer expert. Jessica Ennis, athlete, and Olympic gold medallist in Heptathlon. 61% of the Sheffield’s entire area is green space, and a third of the city lies within the Peak District National Park. 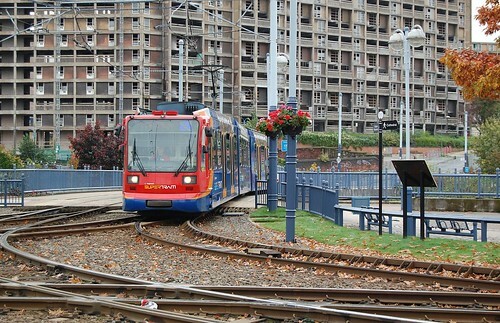 The Sheffield super tram is managed by Stagecoach and provides important links between Meadowhall shopping centre and the city centre. 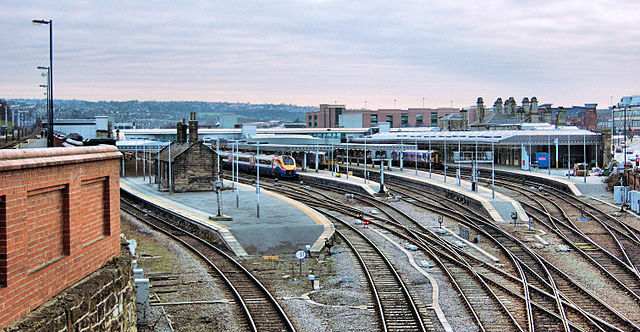 Sheffield Train station was opened in 1870 by the Midland Railway company. It was the fifth and last railway station to be built in the city. The Duke of Norfolk, who owned land – insisted the southern approach to station be covered in tunnel to hide the view of the railway. The tunnel was later turned into a cutting. It is the 35th busiest station in the UK, and 11th busiest outside London. 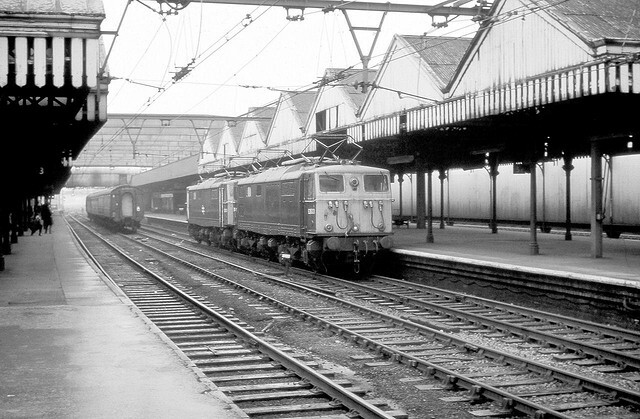 Sheffield Victoria closed to passenger traffic in 1970. Hi, very useful information here, however, I’d just like to point out that Trevor Francis is from Plymouth, despite playing for and managing Sheffield Wednesday. larouchepac dot com —- can save you time. Also see: archive dot larouchepac dot com/1932 and: larouchepub dot com. Thermonuclear War is not an option !! CARLOS HAD A DREAM TO BUILD A FOOTBALL TEAM, BUT HE HAD NO PLAYERS SO HE HAD TO SIGN THEM ON LOAN, WE PLAY FROM THE BACK, WITH JOAO IN ATTACK, WE’RE SHEFFIELD WEDNESDAY, WE’RE ON OUR WAY BACK! This was very useful and helped me massively with my homework. Thanks so much!